Our bodies are our lifetime assets and it would only be right to take good care of it. As we get older, we will encounter different changes but with the right kind of nutrition and care for our bodies, we help ourselves age gracefully and live a healthier life. Physical therapy specializes in movement and it aims toward fitness and wellness aspects, as well as correcting purposes. Anyone can benefit from physical therapy, young or old. For this reason, our Home Care Services in Bowie, Maryland has afforded this medical approach to help an individual in need of body enhancement, whether to regain the use of their bodies or for their total well-being. Aging adults are generally more prone to accidental falls and a sedentary lifestyle does not add to helping a senior get a wide range of movement. Physical therapy helps us understand how our bodies work better when we do not rush it to perform our daily tasks. As simple as sitting down and sitting properly can already affect our spines. Through physical therapy, even when done at home, gives seniors an improvement in mobility that will help them avoid slipping and falling. Injuries can strike anyone, anytime. But with consistency and the right Home Health Care services, recovery can be faster than expected. Especially when the patient gets all the right kind of motivation that will help them find the purpose to get better not only for themselves but also for their families. When we get properly informed about ways to take better care of bodies and bones, we help ourselves delay any signs of aging because we can remain active and agile even in our senior years. Physical therapy not only cures physical conditions; it also enhances our bodies for a much better quality of life. 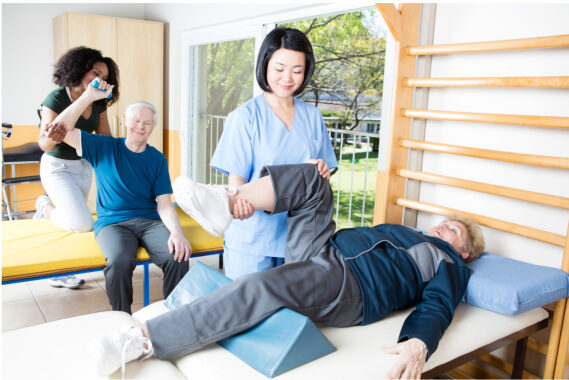 Having physical therapy is not just to make aging adults better, even people under the age of 65 can reap the benefits of physical therapy, especially when they need it to make a better version of themselves. Send us a message and let Novena Health Care Services guide you to a better you. This entry was posted in Physical Therapy and tagged body enhancement, Home Care Services, Home Health Care. Bookmark the permalink.